Today our class, along with the grade 5 and 6 classes at St. Elizabeth School had the opportunity to meet Josh, one of the people who inspired our Make A Difference Project! 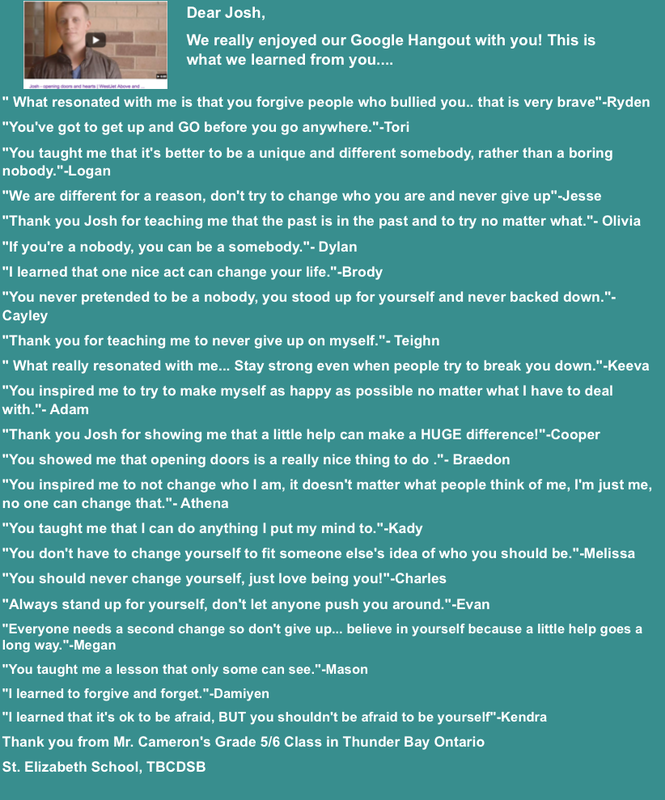 We all learned so many important lessons from Josh’s Story. We were so glad to “meet” you via Google Hangout today, we want to share what we learned from you! April 11, 2015 Oh the Places We’ve Travelled, The People We’ve Met and the Things That We’ve Learned! Click on each marker on the map to learn about our learning journeys! March 4, 2016 Meeting Renowned Photographers! meet renowned photographers Bill Frakes and Laura Heald. In 2013, I listened to Bill speak in Austin Texas. Bill’s Keynote presentation was one that I have never forgotten. His ability to tell a story through photos left me awe struck. I later had the opportunity to meet both Bill and Laura in person and was surprised to hear that they had a connection to Thunder Bay as they had visited here on occasion to purchase camera equipment! With fingers crossed, I hit the send button and within ten hours Bill responded stating he would be happy to help if we could work it out logistically! My students were pumped and exactly one month later Bill and Laura “visited” our classroom for 45 minutes to share their love of photography and adventure, offer photography tips and help further instill in my students a belief that anything is possible. This link: Our Letters to Bill and Laura shares the letters that each student wrote to our classroom guests after our Google Hangout. Thanks Bill and Laura for making a difference! February, 2016 Meeting People and Travelling to Places, Both Near and Far Away! We have had the pleasure to meet some incredible people this year! Mayor Hobbs, Minister of Provincial Parliament Bill Mauro and Member of (Federal) Parliament, Don Rusnak have all visited our classroom and have personally congratulated us on our Make A Difference Projects. Mr. Rusnak was so impressed with our M.A.D Project that he will be speaking about it in the House of Commons and challenging other MP’s to get their communities involved! We have also travelled to many incredible places both near and far away. We are amazed by what we have seen, who we have met and how we have learned and been inspired! More can be read about some of our adventures by visiting our “Learning Through Adventure” and Inspired Writing blog pages.